My local club has decided to have an .049 fly day. Sounds good to me and I actually have a Stuntman 23 and a Sig Deweybird properly powered by Cox .049s. What I would like to take out is a HyperViper. It is a NIB model that I obtained from a fellow getting out of modeling. I have been told by a different acquaintance that the plastic bosses in the fuselage for using screws to hold bottom to top are made of poor plastic that will break when I try to join top to bottom after installing the wing. My acquaintance told me to substitute 2-56 screws and nuts, but there doesn't seem to be a way to do that. He then said to wrap the fuse with clear packing tape. Has anyone in CEF-land had any experience with this model and things that might be considered to make it last? 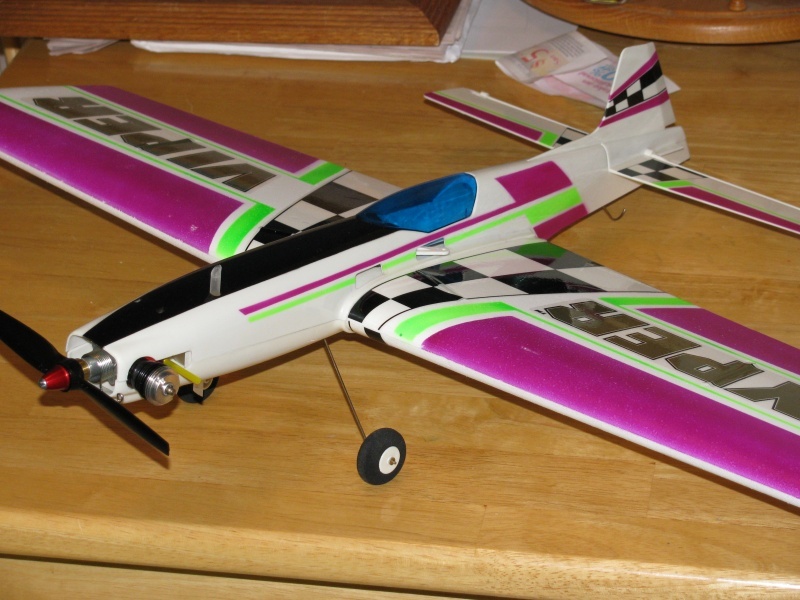 I assembled one not long ago and found no issues with the screws, I have had problems trying to use a standard screw in place of the special Cox screws for plastic on other models. Maybe taping the post first with the Cox screw will help. I never got to fly the Hyper Viper and wound up sending it to a young man Down Under. Some of these models had problems with the fuel tank, make sure it flows well. Also I had problems with the elevator hanging up because of flashing from the mold but a little sanding fixed that. I have heard of taping up the bottom fuse where it is open for better performance. Getting the last two engine screws in was a challenge without a magnetic tip driver. Got it, thanks for the suggestions. I'll see what happens. I like the idea of "tapping" the plastic posts slowly and carefully. I really do not know what my acquaintance did to become as cautious as he was. That's gotta be the prettiest bird Cox ever made, I've lusted over pictures of them for years. It looks like a full blown stunt ship. If only they'd put a Tee Dee in it... or a Conquest on a pipe Lol. RknRusty wrote: That's gotta be the prettiest bird Cox ever made, I've lusted over pictures of them for years. It looks like a full blown stunt ship. If only they'd put a Tee Dee in it... or a Conquest on a pipe Lol. Thanks for the welcome, Rusty. I've watched some of your posts on other forums. Although I have and have had a number of Cox engines, it was mostly due to lingering "first love" feelings. In recent years, I've been more interested in electric, old timer designs, free flight and a slow walk into the C/L world of bigger stuff. But my club's interest in having a 1/2A day got my juices going. I had many a happy time with my Goldberg Swordsman 18 and Jet (?) 21 once I actually got some experience with my Ringmaster and Flite Streaks. Small definitely had an appeal. I'm glad for a reason to get some of the small stuff flying again. Hi Jim, There were no other posts when I started writing this.. (my luck) but here's some food for thought. I don't have any experience with that particular model.. but I have had plastic-post screw-bosses split when a screw is installed into them.. Sometimes it can happen even before the screw tightens all the way. The plastic gets brittle with age.. and in many cases, the screws are the self-tapping type. When new; this wouldn't have been as much of an issue.. but if this model has never been assembled, there's a greater chance of the bosses "splitting". I don't know what the drilled-size of the holes in the bosses are.. but your friend who mentioned using 2-56 machine screws might be correct. The threads in a machine-screw are shallow when compared to a self-tapping screw. If the 2-56 size is big enough to cut threads into the holes in the bosses.. they might be tight enough to hold.. with less danger of splitting them open. As far as the "nuts" are concerned.. he may have meant installing 2-56 threaded-rod "posts" into the bosses permanently.. and retaining the fuse halves with nuts/washers. You can buy 2-56 threaded-rod and cut lengths to size. Make a tool for installing (screwing) them into the bosses by using a 2-56 threaded clevis with another "stub" of threaded-rod screwed 1/2 way into the clevis from the inside (between the arms).. This will provide a "stop" for the rod you want to install into the boss. Once you've reached the required depth in the boss, you should be able to unscrew the clevis without unscrewing your new threaded "post". I would also buy 2-56 lock-nuts. Du-Bro products sells them at your hobby shop. You can install those using a small 1/4" socket by simply turning the socket with your fingers in most cases. The clear packing tape along the fuse-joints is a good idea in my opinion. It will help absorb shock and take some of the stress off the bosses when landing. Good luck.. and hope you have good flights on all three models at your event! Thanks for the comments. It had not occurred to me that inverting the screw threads to be on top and having nuts on the bottom would an approach. My friend wasn't real clear, only that there was a problem with the provided screws splitting the plastic. I will certainly keep this in mind. I think I have sources for the 2-56 threaded rod, so I will look at the components again from a different perspective on how the assembly might be achieved. I do suspect that what I have has aged somewhat. It is clear that it has never been assembled before I got it. In my opinion it would not be wise to use standard thread screws, been there, done that with poor results. A better option would be to glue a sleeve over the post, my plastic was in good shape for its age and the supplied screws worked well. crankbndr wrote: In my opinion it would not be wise to use standard thread screws, been there, done that with poor results. Thanks again. Lots of comments and suggestions to think about here. It is a good thing that the club 1/2A day is tentatively set up for sometime in June! The problem I had with the Viper was the wheels. They’re made from soft foam. If you fly from a hard surface, (asphalt/concrete,) the airplane tends to bounce around on both take-off and landing. Fortunately the wire assembly is identical to, and can be replaced with stock, Pre-Estes, PT-19 landing gear. If I built another one, I would definitely change out the gear. An alternative to sleeving the plastic posts is to wrap them with nylon thread using same technique as attaching guides to a fishing pole. Googling should give you lots of instructions. You end up with both ends of the thread tucked neatly under the wrapping. If you put the nylon on wet, it will shrink as it dries. Then I'd cover with duco cement. With that done, they will break at the next weakest point. Deacon's Shay. kevbo wrote: An alternative to sleeving the plastic posts is to wrap them with nylon thread using same technique as attaching guides to a fishing pole. Googling should give you lots of instructions. You end up with both ends of the thread tucked neatly under the wrapping. If you put the nylon on wet, it will shrink as it dries. Then I'd cover with duco cement. With that done, they will break at the next weakest point. Deacon's Shay. I have used Spiderwire to whip the ends of carbon fibre tubes as an alternative to sliding on an aluminium sleeve to keep the CF from splitting. The good side of the "whipping the ends" approach is that the outside diameter can be whatever it is. Sometimes trying to find a piece of aluminium whose ID is the same OD is a lost cause. Mud: Your caution about the landing gear wire is duly noted. I have a variety of music wire in generally available fractional diameters, and also a good bending device. It is usually a piece of cake to bend up a simple LG. Where that gets tricky is when there are non-planar bends and lack of asymmetry between the sides. I'll take a close look at both LG wire and wheels. Thanks to all that have offered insights. At this point, I wonder why it took me so long to sign on to the CEF and ask the question. Just a thought, as i am a fan of the stuff. Is there room to slide a piece of heat shrink tubing over the posts where the screws go? If so, wrapping the post with Spiderwire then covering it all with heat shrink tubing would give an extra security of the post. NEW222 wrote: Just a thought, as i am a fan of the stuff. Is there room to slide a piece of heat shrink tubing over the posts where the screws go? If so, wrapping the post with Spiderwire then covering it all with heat shrink tubing would give an extra security of the post. Actually, I do not know about the amount of space. I know that a couple of the posts will be tricky to get to for one with fat fingers. I might have to promise someone a really nice dinner if she could work the line around the posts. I should know more after this weekend. Thanks for the suggestion about using heat shrink. While that does require an open end to slip the HS tubing over, it would help compress things. It is clear that I need to disassemble as much as possible to determine which options are feasible.